Packed for the possibility of repeating the triple crown of the 70s, Ajax will host Juventus on Wednesday, April 10, for the first leg of the quarter-finals of the 2018/2019 European Champions League. At the Johan Cruijff Arena in Amsterdam, the match starts scheduled for 16h (Brasília time). The return game in Turin is scheduled for April 16. The draw for this stage set the path to decision. Whoever takes the best in this duel will have the winner of the dispute involving Tottenham and Manchester City.The setting criteria are the same as in the previous steps. Those who add the most points advance. In case of equality, the tiebreaker criteria are, first, goal balance and then goals scored at the rival’s home. If they are insufficient, a 30-minute extension will be held, in which the goal away from home is also worth more. The last resort is the penalty shootout. Finalist of the Cup of the Netherlands, the Ajax assumed the leadership of the Dutch Championship at the end of the week. On Saturday, April 6, the capital team defeated, as a visitor, the Williem II, which will be their rival in the decision of KNVB Beker, which is scheduled for May 5, 4 to 1. It achieved, in this way, the 71 points (23 wins, two draws and four losses).On Sunday, April 7, PSV, who could overtake it, was in the tie, 3 to 3, against Vitesse. So he managed to just match up on the score. It takes, however, disadvantage in the balance of goals. The Ajax, who reached the mark of 100 goals in 29 matches and has the best attack of the Dutch Championship, has a spectacular surplus of 74. The Eindhoven team has a balance of 65. Five matches remain.The scenario allows Ajax fans to dream of repeating the feat of 1971/72, the only time in history that the team has won the Champions League trophy in addition to the two national competitions. The atmosphere of optimism was even greater after what happened in the last 16 when, after losing at home to Real Madrid, the current three-time Champions League, 2-1, the Dutch reversed the situation by beating the meringues, for 4 to 1, in the Spanish capital.For the meeting on Wednesday, the only casualty is for the midfielder Carel Eiting, who is in the care of the medical department. 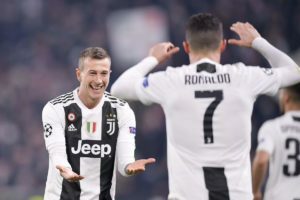 Although the Italian championship was a mere matter of time, Juventus had a dramatic victory on Saturday, April 6, in the classic against Milan. After failing to score with Piatek’s goal in the 39th minute of the first half, he made it to the turnaround in Turin with goals from Dybala for a penalty in the 15th minute and Kean in the 39th minute of the final, in confrontation for the thirty-first round.They reached the plateau of 81 points (27 wins, three draws and one defeat) opening 20 points ahead of second-placed Napoli, who only drew 1-1 at home with Genoa 1-0. winning the eighth consecutive title in the next round, in which he will face Spal at his rival’s home on Saturday, 13 April.The result of Saturday was not the only important thing of the match. She brought other revelations. German midfielder Sami Khedira, who has been out for eight games because of a heart problem, has returned to action. Participated in 66 minutes. It should be among the starters on Wednesday.Cristiano Ronaldo, who suffered a muscle injury while serving the Portugal squad in the March qualifiers for Euro 2020, was not even related. In this way, it continues as a doubt for the meeting in Amsterdam. The same happens with respect to goalkeeper Mattia Perin; defenders Andrea Barzagli and Martin Caceres; and the midfielders Emre Can, Douglas Costa and Juan Cuadrado, who are in the care of the medical department. 1. Statistical data to be taken into account before playing Ajax vs Juventus betting tips! It’s in good shape and won 9 of the last 10 games. Home has been confused just in one of the previous 7 disputes, so it’s a force there. Only one of the last 11 meetings did not score and in 3 did not receive a goal. In the Champions League optimals, he eliminated Real Madrid, the trophy owner. She was forced in 7 of the previous 8 matches, Genoa being the only one to get involved. He has won in 4 of the last 6 away games, so he does well on foreign ground. In 7 of the previous 8 duels he scored and in half of them did not cash in. He passed Atletico Madrid in the Champions League qualifiers thanks to his home win. 2. Latest information before Ajax vs Juventus! Mazraoui is suspended because of the cumulus of yellow cards. Carel Eiting is injured, but anyway, he has little chance of being a holder. According to goal.com Juan Cuadrado has medical problems and will not play. Douglas Costa has been injured for some time, and he’s still getting back. Emre Can and Andrea Barzagli seem to be unavailable for this duel. Cristiano Ronaldo is uncertain after he has suffered a match of his national team. 3. Ajax vs Juventus Probable Team! 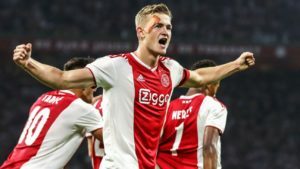 Ajax (4-3-3): Onana – R. Kristensen, M. de Ligt, D. Blind, Tagliafico – D. van de Beek, F. de Jong, Schone – Ziyech, Tadic, Neres. Juventus (4-3-3): Szczesny – Cancelo, Bonucci, Chiellini, A. Sandro – Pjanic, Bentancur, Matuidi – Bernardeschi, Ronaldo, Mandzukic. 4. Ajax vs Juventus Latest Last Date Info! The two bands have not been back for a long time, since 2010. The Ajax has produced throughout the season high quality football season in much greater number than Juventus. However, with a fairly young cast, it also oscillates much more than its rival. For this reason, the solid Italian style, even if they are deflated Cristiano Ronaldo, makes the prognosis in the success of visitors is the best for Wednesday’s meeting for the quarterfinals of the 2018/2019 version of the Liga dos Champions of Europe. In my opinion Juventus is the stronger team with a more valuable lot. She has a much larger European experience, and that counts enormously. “The Old Lady” is unbeaten in 7 of the last 8 games and in 6 were maximum 3 successful. Ajax was not scared in the home game with Real Madrid, losing 1-2. It’s hard to believe there will be many goals because both bands have good defenses.